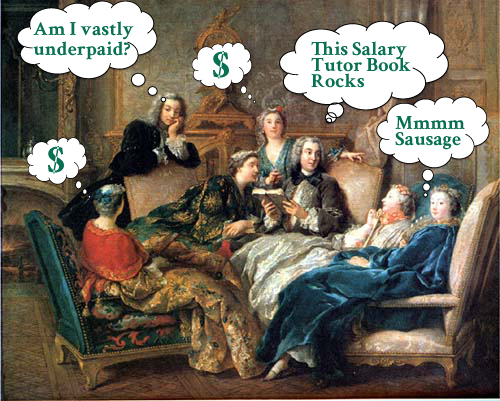 What is a Salary Salon? This event is a fun, entertaining, and informative gathering of cool people. I had always thought about offering my services to women’s book clubs — it brings together a fun group of people, they need book ideas, and unlike discussing the plotlines of 50 Shades of Grey, my book could actually increase their income. It was the perfect demo, since statistically women negotiation up to 9X less often as men. We adjusted the plan slightly and decided to do a brunch, and I even offered to cook. While my signature brunch dish was delicious, cooking for 10 was a little bit daunting and we got a late start. So moving forward, the format might be better suited for an evening wine and cheese tasting. Jim is the author of the book “Salary Tutor: Learn the Salary Negotiation Secrets No One Ever Taught You,” which has been featured in the Chicago Tribune, New York Post, and Forbes. Based on his own experiences in the working world, it uses an easy-to-follow storytelling approach — along with case studies, illustrations, and just the right touch of humor – to help people get paid what they deserve. He writes for Salary.com, Payscale.com, and other business websites, speaks on the topic of salary negotiation, and teaches an in-depth class on salary negotiation skills.